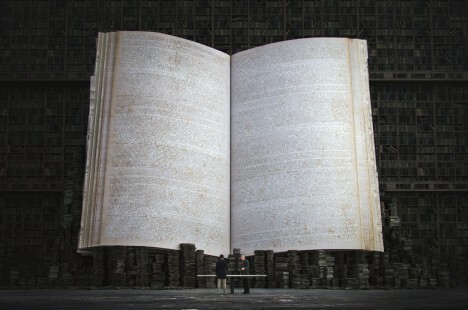 All of the books in the world still exist, yet are just out of reach, locked up in an impenetrable fortress or stacked so high we can’t hope to reach them, in this dystopian vision by Shanghai-based artist Jie Ma. 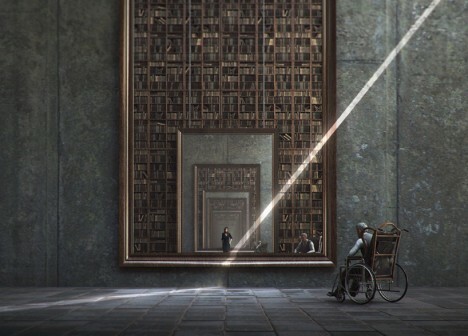 The series of fictional libraries renders information inaccessible, teasing us with glimpses of what we could have but always keeping it just beyond our grasp. 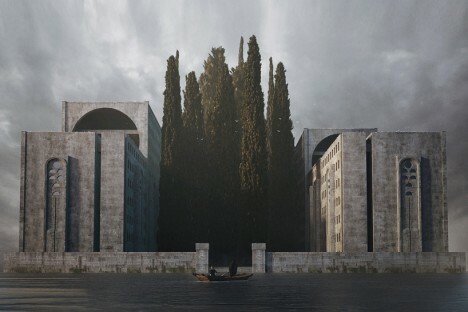 Combining futuristic fantasy art reminiscent of movie or video game concepts and architectural assemblage, Ma’s series envisions libraries as stark structures that haven’t quite been abandoned altogether, but aren’t exactly in great shape. 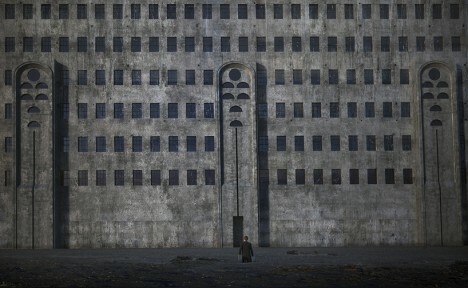 Human figures mill around in seeming frustration, stopped from actually finding anything by darkness and disorder. In some of the images, books are scattered around in spaces that look as if a storm has just ripped through, or they’ve been left to deteriorate for decades. 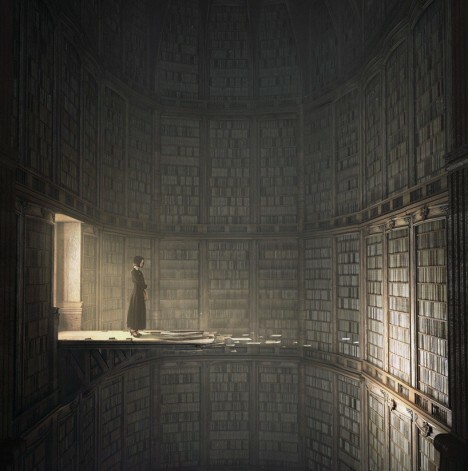 It’s impossible to see the spines of any of the books, and there are no ladders offering access to shelves that tower many dozens of feet into the air. 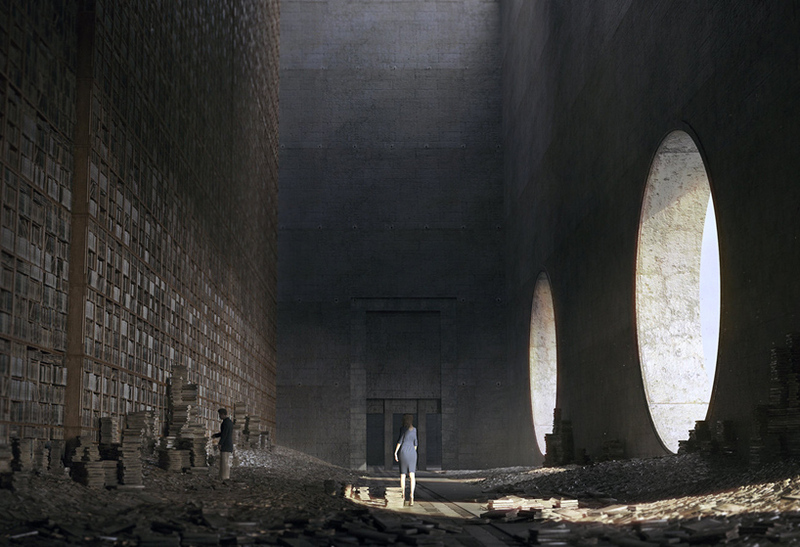 In a bibliophile’s worst nightmare, walkways to rooms full of books have crumbled away. 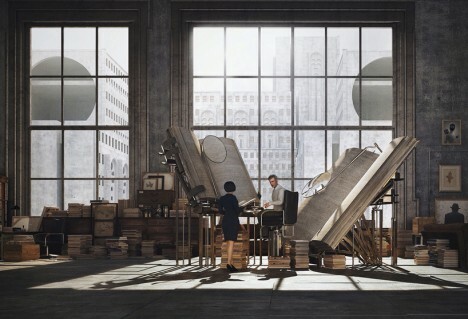 Yet, in contrast to these scenes are more hopeful ones, in which people examine oversized books with gigantic magnifiers in orderly rooms overlooking concrete landscapes. 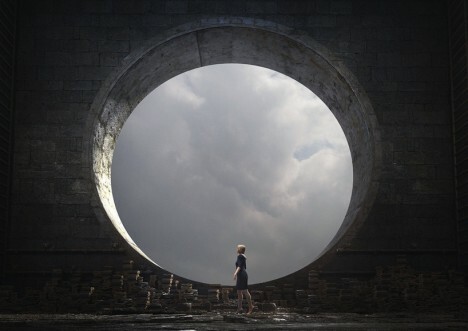 The series seems to suggest a sense of hope for human curiosity, driving us to keep seeking knowledge no matter how many obstacles we may encounter.